Review: Filtrete Water Pitcher From 3M! 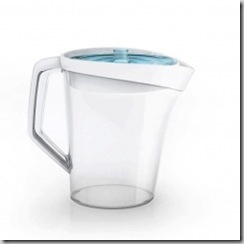 You are here: Home / Great Deals / Review: Filtrete Water Pitcher From 3M! When I was a kid, I never cared if the water came out of the fridge or not, I drank it straight from the tap, in fact if I was thirsty enough, I would drink it straight from the hose outside without ever coming in the house! Kids today would say that both of those are “gross”! Now, I remember when I got older getting a fridge with the water in the door – now THAT was worth coming in the house to drink! All my friends agreed – we would all line up and fill cup after cup of the cold water or ice water and drink to our hearts content! Now, we have discovered filtered water! I don’t think my kids ever drink tap water, it is always from the water bottle in the fridge! So, we have a filtered water pitcher that we use and they all , including my hubby like it much better. Well, not me – I think it has an odd taste to it, I like tap water. So, when Filtrete sent me their Filtrete Water Pitcher from 3M to try, I thought I would be testing it on the kids and my hubby and seeing what they thought – since it wasn’t my cup of tea water. But, right off the bat, I thought I would try a glass – pleasantly surprised – I found that it did not have an odd taste to it – it tasted like “plain ol’ water” to me! My kids and hubby like it, too. I like the design of the pitcher – I can’t really tell you why I like it more than the other one – it is just more pleasing to look at for me.. It does seem to hold more water than the one we had and it filters faster – sometimes it’s needed in a hurry! You know how all our lives are too rush – rush! So, we have a Pur water pitcher – we have bought 2 of them, the first one broke at the handle – this one from 3M seems sturdier to me. Filtrete created Clear Advantages to help busy moms like me. You can register to receive seasonal e-newsletters featuring money-saving offers, filter change reminders, better home living tips and more by signing up on the Filtrete Water Filtration Products website. You can also follow Filtrete Water Filtration Products on Twitter (@FiltreteWater) or like the brand on Facebook for healthier living tips. You can learn more about this water pitcher and even watch a video on it here. I have used a Pur water dispenser that I used for years and I agree it is as slow as molasses, but I loved the water compared to what we got out of the tap. I used to use a filter that you screwed onto to the sink faucet but it was bulky and not every good looking although it did the job. I have since purchased a new refrigerator with an in-line water filter, but to tell you the truth I don’t like the taste of the water that I get from from the in door refrigerator water dispenser as much as I do the Pur water dispenser. After reading your article and seeing your video on the Filtrete pitcher I am going to try it out. Thanks for giving me an alternative to consider. Which ever way I decide to go it will be a lot cheaper than store bought bottled water and taste just a good if not better. Personally I do not buy the claim that the bottled water companies make about their products and have learned that many of them are just tap water any way. @FrugalFather: I feel the same way, they have to be plain tap water! It’s crazy! I do like the taste of the water in the Filtrete one for sure. I don’t like the taste of the water from the fridge or from the Pur either. So, fast and tastes good – that’s good for me!